The prime (and leafy) British Embassy, the eye-catching MahaNakhon Building and a gigantic Central-JD.com hookup were the largest purchases of 2018. Despite political uncertainty, it was still business as usual in 2018 with several megadeals leaving investors stunned at their sheer size. From e-commerce to physical edifices, here are the top three groundbreaking deals of this year. A scarcity of freehold land plots in bustling central business district (CBD) locations continues to drive land prices to new record highs, with the sale of the British embassy’s last plot on Wireless Road earlier this year posting the highest figure for a land deal in Thailand’s history. The plot of nearly 23 rai was sold in January 2018 to a joint venture consortium of Hongkong Land, a member of the Jardine Matheson Group, and Central Group for over £420 million (18 billion baht). The price per square wah of this plot more than doubled in 12 years to 2 million baht from 950,000 baht in 2006 for the embassy’s first plot next door, sized nine rai. It was sold to Central Group, which developed the luxury mall Central Embassy on the land. However, the highest price per sq w remains an 880-sq-w plot on Lang Suan Road, 800 metres from the former UK embassy. It was acquired in late 2017 by SET-listed developer SC Asset Corporation Plc, a property arm owned by the Shinawatra family, through a sealed bid for 3.17 million baht per sq w.
SC wants to develop an ultra-luxury condo project on the plot. Based on the land price, the sales price of condo units could exceed 500,000 baht per sq m, said SC Asset chief executive Nuttaphong Kunakornwong. Aliwassa Pathnadabutr, managing director of CBRE Thailand, a property consultant and the sole agent of the two plots, said land prices in Bangkok peaked twice prior to the Lang Suan plot last year. The first peak was in 1996 during Thailand’s first property bubble. It was 400,000 baht per sq w on Lang Suan Road after the floor area ratio permitted for building construction increased from 6:1 in 1992 to 10:1 in 1994. Land prices peaked again in 2006 in the country’s second property cycle, she said. 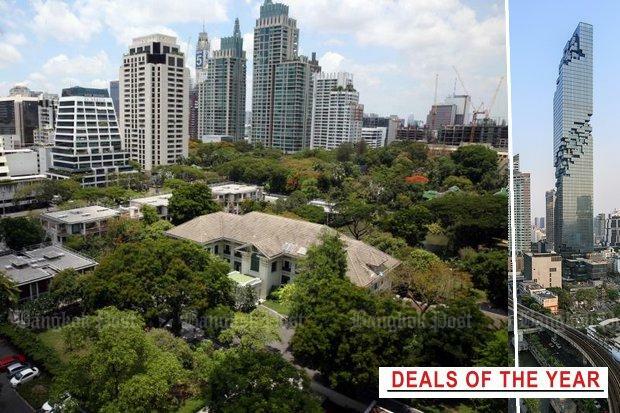 This time the British embassy’s first plot on Phloenchit Road was offered for bidding. After that, land prices offered on the road soared to more than 1 million baht per sq w, said Ms Aliwassa. As the number of potential freehold development sites in the CBD drops, land prices will continue to rise. In some cases, land prices will be higher than the value of the existing building on the plot. The market will see older towers being demolished and the sites redeveloped, she said. CBRE said this phenomenon happened with the demolition of Kian Gwan Tower I on Wireless-Sarasin Road, and the Vanissa Building on Chidlom Road. Recently, the Dusit Thani Hotel was planned to be demolished, with a redevelopment expected. The Real Estate Information Center (REIC) reported in October this year the price index of vacant land in Greater Bangkok rose by 31.6% year-on-year in the third quarter, largely driven by rises in land prices for locations along the mass transit Orange Line. The price index for vacant land in Greater Bangkok was 219.2 in the third quarter, up slightly from 217.8 in the second quarter, but soaring from 166.5 a year earlier. Another large property deal to emerge this year was the acquisition of MahaNakhon, Thailand’s tallest skyscraper, by a duty-free kingpin from a financially ailing property firm in a deal worth over 10 billion baht. Pace Development Corporation, a SET-listed real estate firm, has sold 14 billion baht worth of assets, including a substantial part of MahaNakhon, to travel retailer King Power. The deal was sealed by King Power MahaNakhon, a subsidiary of King Power, in April. King Power is the country’s biggest duty-free retailer and owner of English Premier League football club Leicester City. 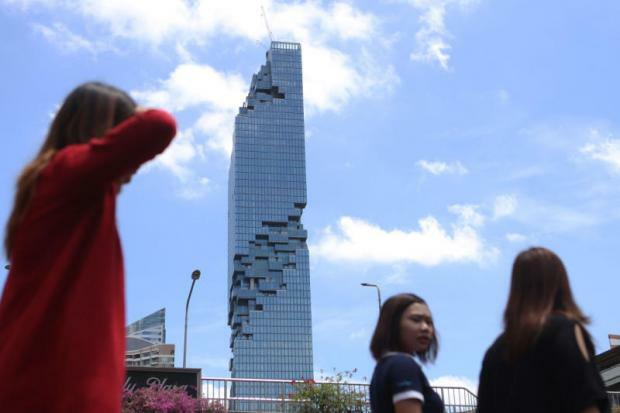 Pace said the portions of the 22-billion-baht MahaNakhon project it sold are land, the 155-room The Bangkok Edition hotel, an observation deck, MahaNakhon Cube retail building, sculptures, paintings, operating licences and related contracts worth a combined 12.6 billion baht. It also sold land jointly owned by its subsidiaries worth 183 million baht. The major part of the project not included in this deal is the 209-unit freehold condominium, the Ritz-Carlton Residences Bangkok, which is more than 75% sold. Known for its pixelated look, the MahaNakhon skyscraper saw its name change to “King Power MahaNa­khon” in July after the deal was signed. Pace launched MahaNakhon, a mixed-use project comprising super-luxury condominiums, a hotel and retail space, in 2010, with construction commencing in 2012. Pace has been hamstrung by a series of financial problems, stemming from heavy investment in a short period. In common with many property developers, Pace opted to use short-term debt instruments in the capital market to fund long-term investments. The practice, however, is viewed by some as a mismatch in terms of funding and repaying debt. Pace chief executive Sorapoj Techakraisri said the company’s total debts will fall below 10 billion baht by the middle of 2019 from 15 billion at present after securing 14 billion from the sale of assets at MahaNakhon. As of the end of 2017, Pace had a sales backlog of 38 units worth 3.2 billion baht at the tower, which are to be realised in 2018. The company expects to be able to reduce its debts to a few billion baht by the end of 2019 with the completion of three projects next year. One of them is the 8-billion-baht Nimit Langsuan condo, which recorded 7 billion in presales. The other two comprise MahaSamutr, a luxury villa project in Hua Hin worth 4 billion baht, and Windshell Naradhiwas, a high-end condo worth 3 billion on Narathiwat Ratchanakharin Road. Pace registered a net loss of 1.1 billion baht in the third quarter of 2018, 15% larger year-on-year than the 961-million loss logged in the corresponding period of 2017, according to the company’s management, discussion and analysis ending Sept 30. The company’s total asset value stood at 21.7 billion baht as of September, while total liabilities were logged at 20.3 billion. 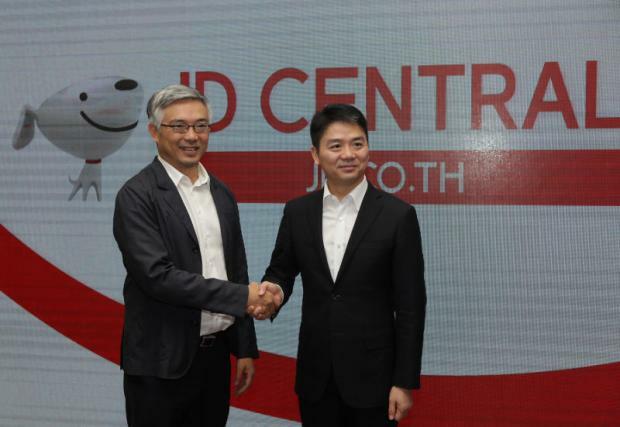 The partnership of Thai retail company Central Group and JD.com, China’s leading e-commerce player, shook up the platform in Thailand. The e-commerce business in Thailand has seen fierce competition in the past 24 months, with new entrants joining the fray, investor changes and a withdrawal of foreign investors after burning through cash flow to try and grab market share. JD.com entered into an agreement with Central Group for a US$500 million (16.3 billion baht) deal in September 2017, with the former aiming to expand its footprint in online retail and financial services in the second’s largest economy in Southeast Asia. Thailand is an attractive market because of its preference for high-quality products and the rising number of middle-income consumers. The partnership with Central Group should enhance the customer experience for online shopping and logistics for JD.com users, as well as warehouse and delivery capabilities. The venture is a marketplace providing goods from selected qualified merchants, most of whom are brand owners and small and medium-sized enterprises. The marketplace offers more opportunities for local partners as JD.com can sell its technology to them, helping retailers increase their efficiency through customer insights developed from big data analytics, and automated warehouses and delivery. The two commercial titans have been working on a combination of offline and online, serving the online-to-offline trend. The new company JD Central started operations in September 2018, one year after the agreement, following a three-month soft launch. JD Central plans to open an automated retail store in Bangkok in 2019, aiming to be the market leader for online retail in Thailand by 2020. Having started with 16 employees in early 2018, JD Central now has 1,000 workers, of which 98% are Thai. Some 600 employees work in logistics and delivery as of September. In March 2018, TCC Group, controlled by tycoon Charoen Sirivadhanabhakdi, announced the acquisition of Tarad.com, signalling consolidation in Thailand’s hyper-competitive e-commerce market. TCC was estimated to have paid at least 250 million baht for Tarad.com’s debt. The investment will strengthen TCC’s digital business arm by allowing the company to better analyse and monetise data. Tarad.com became profitable again by the end of 2018, transforming itself from a local e-marketplace to an end-to-end e-business solutions firm, known as universal commerce. The website will change its revenue model from commission fees to the freemium model by letting merchants use some basic features for free, but paying for additional services. Tarad.com recently started its journey of transformation to e-business solutions by collaborating with Singapore’s Shopee, making products for Tarad’s merchants to integrate with Shopee’s system automatically. Previous articleAsk Kate About Beer: What’s the best way to pack beer for air travel?